Prostrating at LORD LAKSHMI NARASIMHARS LOTUS FEET , Adiyen feels honoured to share the divine experiences of our yaathirai to Ahobilam Divya desam. Every darshan is special . Our first trip was 20 years back and later we had darshan every 2-3 years . Ahobila Mutt authorities had taken the holy initiative to develop this kshetram on war footing and made it convenient for the piligrims to have darshanam of all the Nava Narasimhar temples over a period of time thus making it easier to approach compared to 20 years back. We offer humble obeisances to his holiness Jeeyar and the Mutt followers as this holy initiative from HIS HOLINESS has really made pilgrims journey more simple .. Presently nine archakas ( priests ) have been appointed who perform Nityathiruvaaradhanai ( worship) to all the Nava Narasimhars .They travel by Cycles/ Mopeds /Walk to the temples and are very cooperative with the pilgrims explaining the importance of the temples . Adiyens sincere acknowledgements to Ms.Ramesh , the author of “108 DIVYA DESAMS”and members of Sri Rangasri group ,who helped us to undertake this pilgrimage a decade back . Adiyens recent visit five years ago was most memorable . Out of the 108 Sri Vaishnava divya desams, two are in Andhra Pradesh, Tirumala and Ahobilam. Both the divya desams are situated in the Nallamalai Hills in Chittoor districts respectively. Ahobilam is about 68 KM from Nandyal Station . 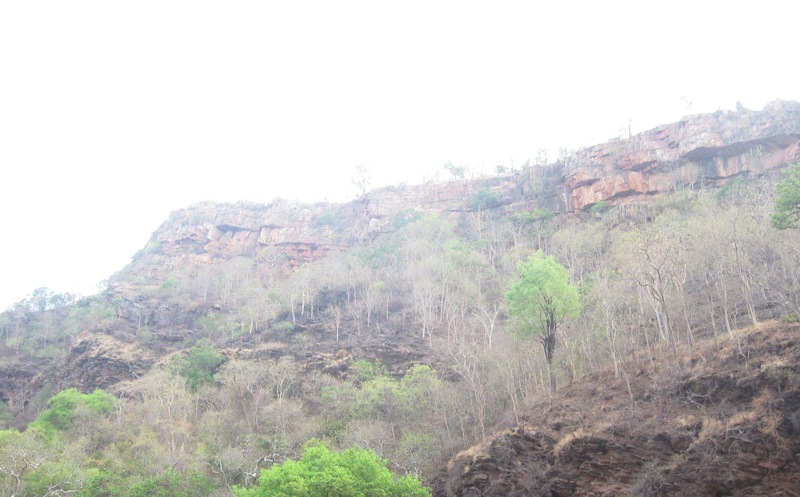 As per the Puranas, Nallamalai Hills is the personification of Adisesha, the great serpent bed of Perumal. Srisailam, one of the famous ParamaShiva sthalams is the tail end, Ahobilam is the middle portion, Tirumala is the head and Srikalahasti, another Shiva kshetram is the mouth of Adisesha. Thus, the sacred hills houses two Vishnu and two Shiva kshetrams. Veera kshetram, and finally pancha kosa kshetram etc.for the following reasons. VEDACHALAM :-Perumal restored the Vedas to Brahma by killing Somuka, an asura. 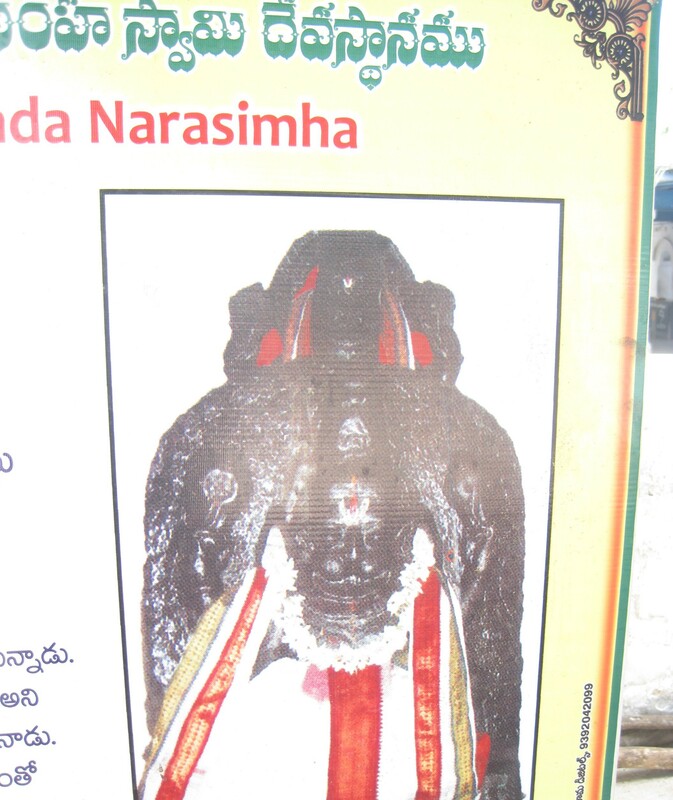 GARUDACHALAM:-Perumal blessed Garuda who was doing penance here. All the nine temples are situated within a radius of 5 krosas or 10 miles or 16 kilometres. 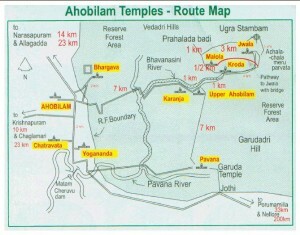 Ahobilam is situated 25 Km from Arlagadda a small town in Kurnool district and can also be approached via Cuddapah district. It is situated on hills amidst thick jungles. The local tribals are very kind . Earlier , almost all the temples were scattered on the hills with no direct route , one was forced to walk back the way he came and then go to the next temple ,but now the scene is different . Great care has to be taken while trekking especially when we trek the holy hills . Added to this, the place is inhabited by wild animals and monkeys. Due to monkey’s menace, even eatables have to be taken with utmost care. It is always advised to take help of local guide. Thirumangai Azhwar’s mangalasaasanam comprising of 10 pasurams describes the divya desam beautifully. 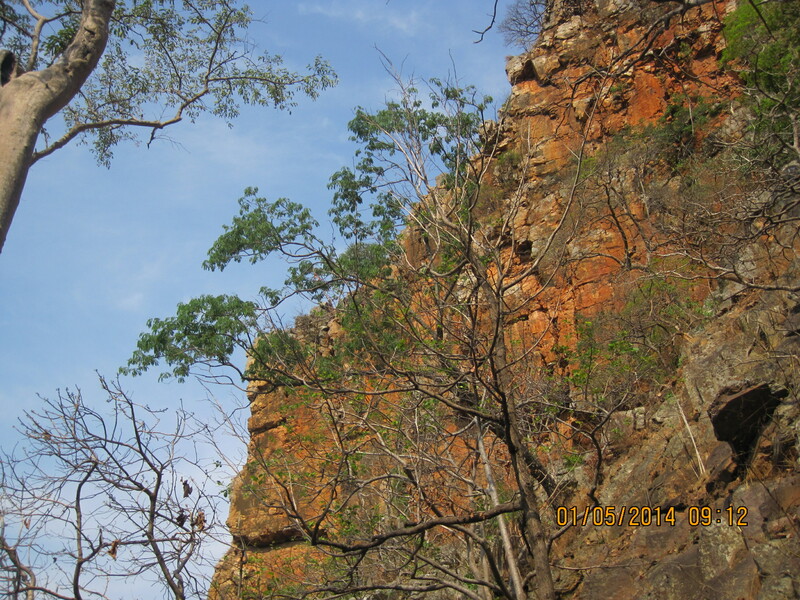 Azhwar describes Perumal’s ugra swaroopam and the scenic beauty of this place. 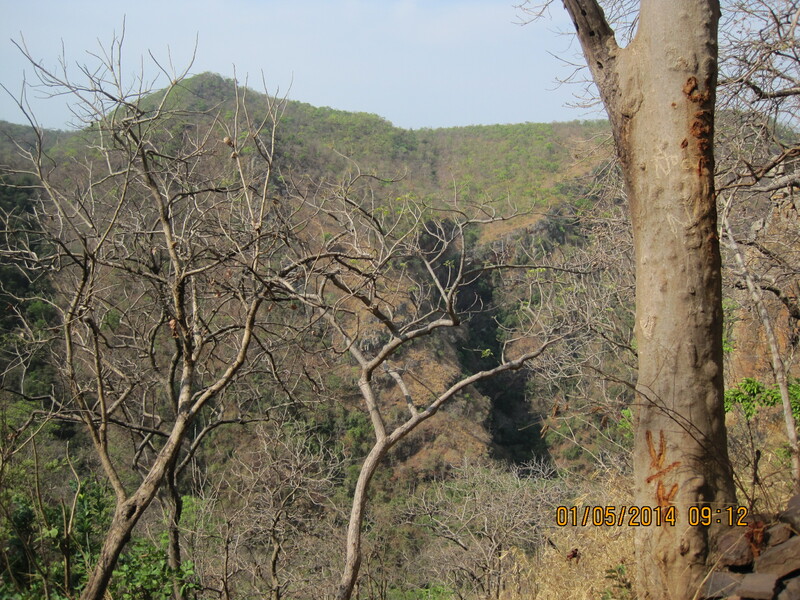 In the first 8 pasurams, Azhwar describes how difficult it is to reach this place which is inhabited by wild elephants, tigers, lions and the tribals . Azhwar quotes that even tigers and lions offer their prey to Perumal before eating them. 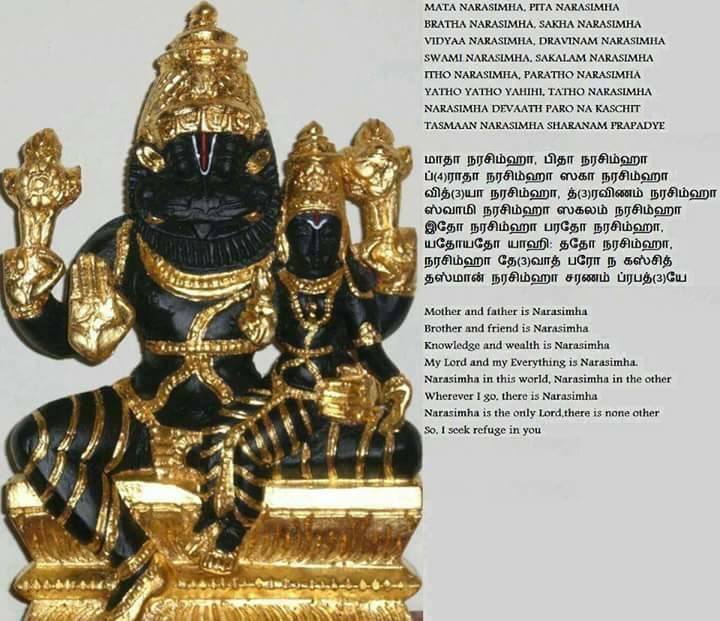 But in the 9th pasuram Azhwar says that these difficulties would be faced only by the enemies and demons and the bhaktas need not have any fear because here Perumal residing along with goddesss (Thayar) would always protect the devotees. This pasuram boosts our confidence level and take refuge in Him. Every nucleus in Ahobilam reverberates with Lord Narasimha’s holy name. As per sthalapurana , Jaya and Vijaya, the dwarapaalakas gate keepers of Sri Vaikuntam were puffed up with ego due to their proximity to Perumal. They were cursed by Sanathakumara brothers (who were the Manasaputras of Brahma ) to get separated from Lord (Perumal). The repentant dwarapaalakas were given the option of either living a pious life for 100 births or become demons for 3 janmas ,develop enmity towards the Lord and finally get liberated by Perumal. They opted for the latter and hence were born thrice. In their first janma, they were born as Hiranyaaksha and Hiranyakasipu,they took their second birth as Ravana and Kumbakarna and in their third birth, they were born as Kamsa and Sisupaala. LORD declares in Bhagavad Gita that He will appear to protect His devotees and destroy the enemies. 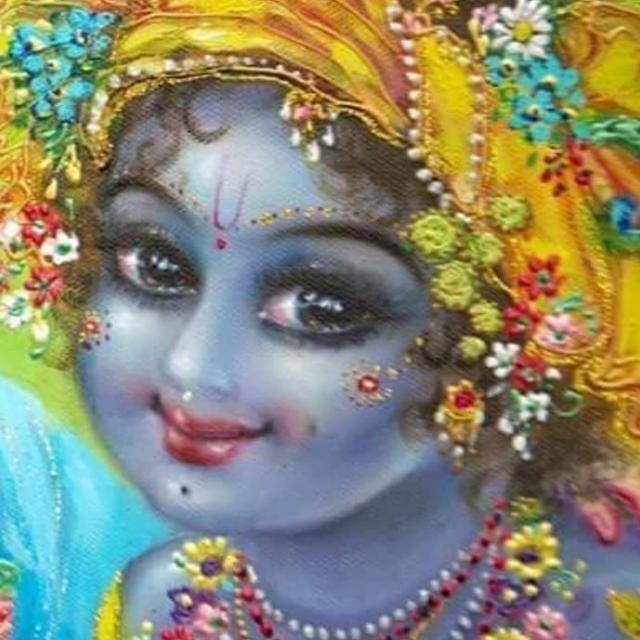 So whenever the earth becomes overburdened with sinners,the Lord manifests Himself to protect His devotees. 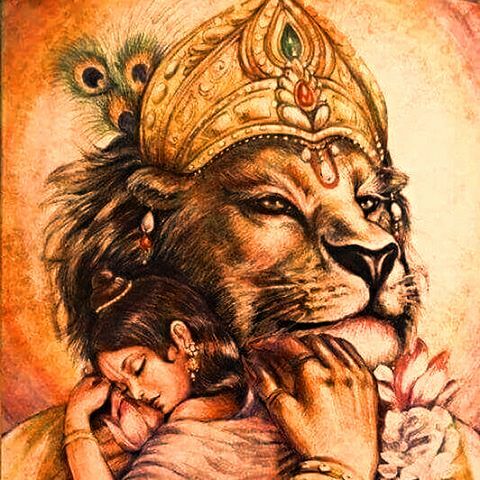 Narasimha Avataaram is one such avataaram where the Lord appeared to protect the great child-devotee, Prahalada by killing his father, Hiranyakasipu. 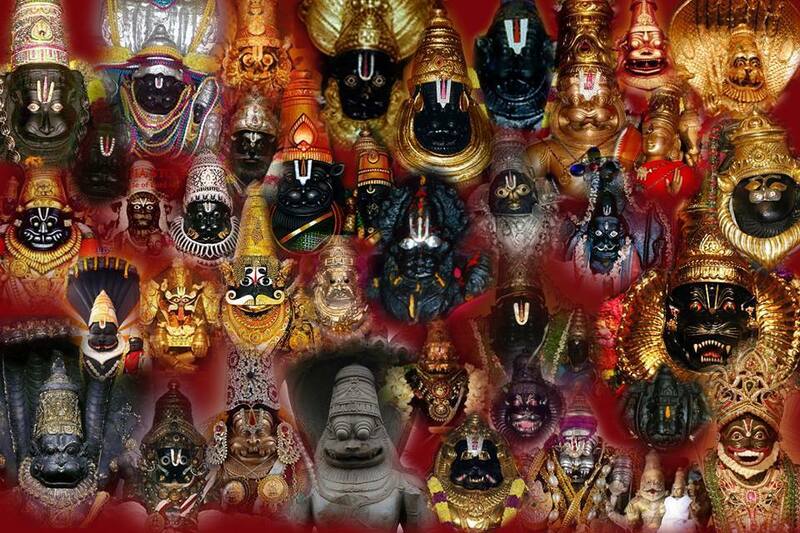 The Narasimha avataaram is the only avataaram where the Lord appeared as “half beast half man “ a rare combination. It is only in this avataaram that Lord depicts contrasting feelings of “sowlabhyam”and “krodham” i.e. love and hatred with the same organ, “eyes” at the same time. The Lord was full of compassion and love to the child devotee , Prahalada and at the same time was fierce and angry with Hiranyakasipu. Hiranyakasipu with his severe austerities had wittingly acquired a boon from Brahma that he should not get killed by any of Brahma’s creation, he shouldn’t die either during day or night, he shouldn’t die either on earth or in the sky, he shouldn’t be killed by using any weapon or astram. Puffed up with the confidence that he couldn’t be killed as fulfilling as the above conditions would be impossible, he had become notorious and tortured pious people. He developed hatred towards Lord Vishnu. But his son, Prahalada was a born Vishnu Bhakta. All his advises to realise the soul and seek Narayanan’s Holy feet became invain. The wicked rakshasa started torturing his son by throwing him from top of hill, administering poison, throwing him in sea, fire etc. All the efforts of the rakshasa became futile as his son was protected by Lord. He realised the purpose of birth and had absolute faith on the Ultimate. Sri Mukkur Swamy gives a wonderful explanation to the incident when Prahalada was thrown from top of the hill. He says that when Prahalada was thrown by the asuras from top of the hill, he held his hands close to his heart to ensure that Perumal who was residing in his heart as ANTARYAAMI” shouldn’t get hurt. Seeing this act of Prahalada,Bhoomidevi overwhelmed with pity protected the child by taking him in her alms on a bed of flowers. When Prahalada was thrown in the fire, Agni deva protected the child and it was his aunt,Holika , who got burnt. This incident is celebrated even today as “Holi “ festival in India. The asura could not accept the concept of “OMNIPRESENCE OF THE LORD” propagated by Prahalada and as a challenge, he kicked a nearby pillar in his palace and asked the boy to show him the Lord. The asura was fully confident that as he himself had constructed the palace, he was sure that the Lord could not be present. Even before he could complete his sentence, an extraordinary being emerged out of the pillar. The being had a body like a human and a face like that of a lion’s. He had sharp nails like the paws of a lion. This was the most prominent avataaram of the Lord “NARA-SIMHA “ . The Lord with His wonderful form of half-beast and half-man (he was neither a man nor a beast but at the same time, he was the combination of the two) and 10 hands placed the asura on His lap (it was neither earth nor sky), he was holding the asura with two of his hands; pierced the asura’s intestine with his nails, (thus not using any astram or weapon), it was evening when the incident occurred , (thus fulfilling the condition that he should neither be killed in the morning nor night). Thus the Lord killed the asura and lessened the burden of the earth . Even after the samhaaram, the Lord was furious . Thayar and the demigods were afraid to go near him and pacify. It was Prahalada who sang the praise of the Lord known as “PRAHALADA STHUTHI” and pleased the Lord. This sthuthi comprising of 43 slokas contains the essence of Vedanta philosophy difficult to grasp even by mature minds. Prahalada was able to recite this slokam only due to the grace and touch of the Lord. This incident is mentioned in the seventh chapter of Srimad Bhagavatham. The Lord took him on His lap and blessed him to rule the kingdom and finally reach His abode. He also granted the boon that no one belonging to his dynasty would be killed by Him. (This was the reason why Perumal didn’t kill Bali Chakravarthy, the demon-king who was Prahalada’s grandson when Perumal assumed Vamana avataaram , Dhenukaasuran and Banaasuran during his Krishnaavataaram. With His touch, the sins of Hiranyakasipu got wiped off . The Lord conceded the request of the devas to stay back in earth and protect His devotees. He later married Chenchulakshmi, a partial manifestation of Thayar and continues to reside in this holy place even today. To this day, this tribe enjoys special privileges and they get offerings for Perumal’s Thirukalyaanam which is celebrated in a grand way. It was only after obtaining the grace of Narasimhar, Sri Ramar got the information that Ravana had kidnapped Sita Devi. It was after having darshan of Narasimhar,Lord Srinivasar met Padmavathi Thayar and married Her. The presence of the Lord can be experienced even today. To quote few instances, itmay be mentioned that Perumal appeared as a sanyasi to Srinivasachariyar around 500 years ago to the first Jeeyar of Ahobila Mutt and initiated him into Sanyasam and prompted him to propogate Srivaishnavism. The Lord gave the Jeeyar the utsava vigraham of Malola Narasimhar and the deity is in the custody of the Ahobila Mutt Jeeyars for Nityathiruvaaradhanai. The Lord also protected the 33rdJeeyar of Ahobila Mutt from wayside dacoits. The Lord saved Annamacharyar , the great saint who attained the Lotus feet of the Lord by singing His praises, from the harassment of the local king and he got initiated into Srivaishnavism by the then Ahobila Mutt Jeeyar. The Lord blessed King Pratapa rudra by enlightening him about true knowledge. This king contributed to a great extent for the welfare of this place.The present Ahobila Mutt Jeeyar has contributed to a great extent by spending few lakhs of rupees for the renovation of old temples and constructed new temples. The way to these temples has become accessible. 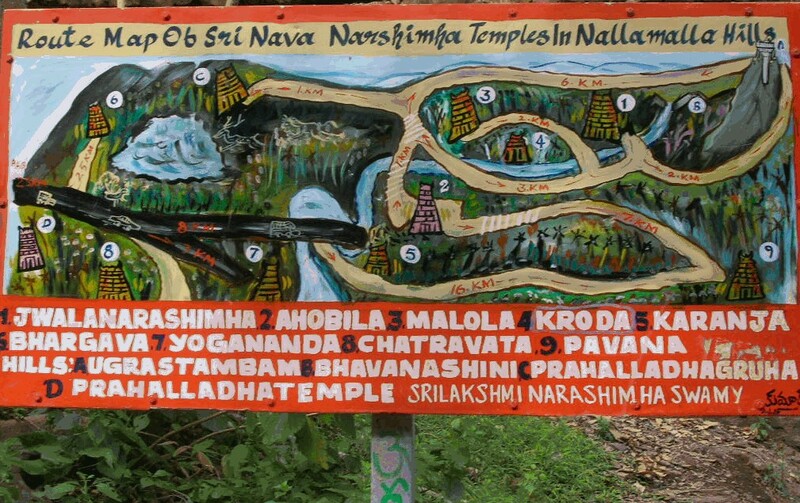 As mentioned earlier, there are 9 shrines dedicated to nine forms of Narasimhar. Out of this Prahalada varada Narasimhar is in Lower Ahobilam, Ugra Narasimhar,who is a swayambhu and is treated as the divya desa Perumal is seen in Upper Ahobilam. The other shrines are scattered all over the hills. Apart from the navaNarasimha shrines, “Prahalada padi” where Prahalada studied and “Ugra Sthambam”from where Perumal emerged are usually visited by pilgrims. There are number of Theerthas in this shrine. A few like konneru near Bhargava Narasimhar , Ramatheertha near Lower Ahobilam and Raktha Kundam near Jwala Narasimhar ,Bhavanaasini near Ugra Narasimhar which flows through both the mountains are a few to name. Adiyen wishes to briefly give the details of the nava narasimhars. Situated at the foot of the hills known as Lower Ahobilam, this temple can be visited by one and all. 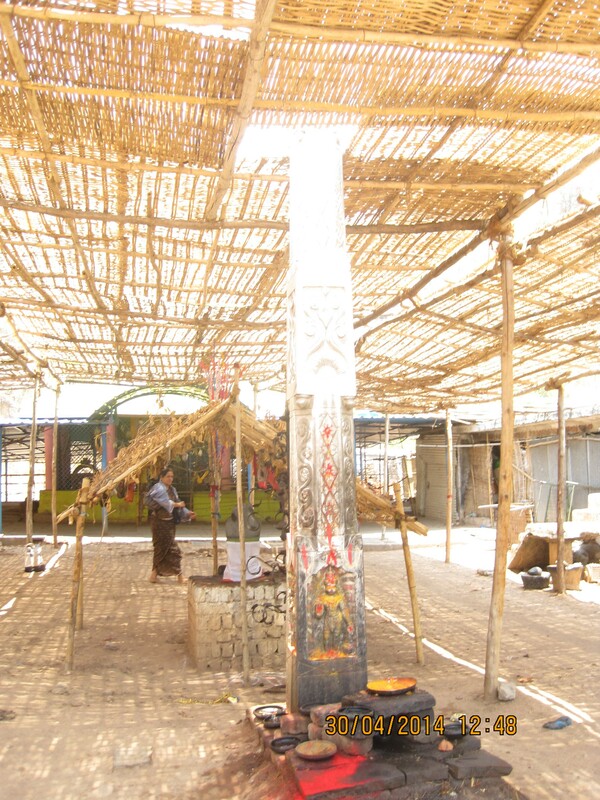 Usually all homams and yagams are performed here. Here Perumal is seen along with Thayar blessing Prahalada. Hence, Perumal is known as “Prahalada Varadar”.The utsava vigrahams of all the Narasimhars except Malola Narasimhar are offered nitya thiruvaadhanai here. To the left of Perumal, utsava vigraham of Pavana Narasimhar can be seen majestically . In front of the Lord, the utsavaiodls of Prahalada varada Narasimhar along with Sridevi and Bhoodevi grace us . 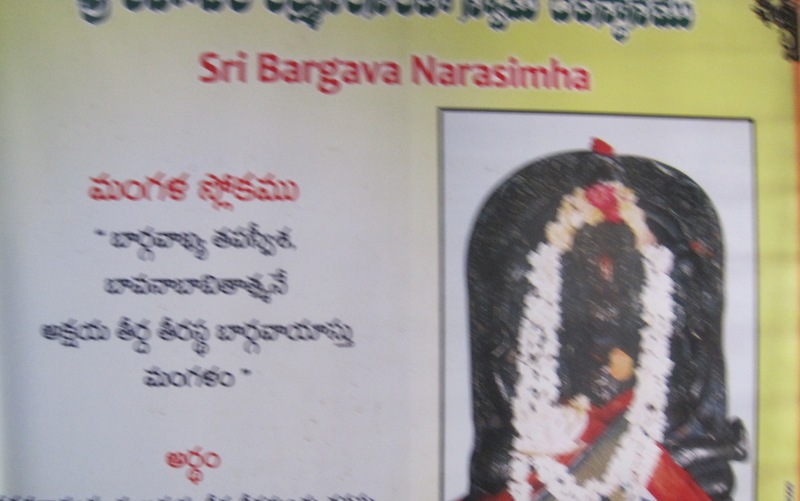 The processional deity of Jwala Narasimhar along with His consorts is also seen inthe garbagriham . The vigraham is superbly carved and on request , thearchakar removes the alankaranam and performs Aaarathi to the idol. This idol has 10 arms and Hiranya vadham (killing) is beautifully depicted. There is also a small vigraham of the first Ahobila Mutt Jeeyar facing south. The temple is a huge and many monkeys can be seen here. The walls of the temple depict the sthala puranam briefly. There is a Thayar Sannidhi to the right of the temple. 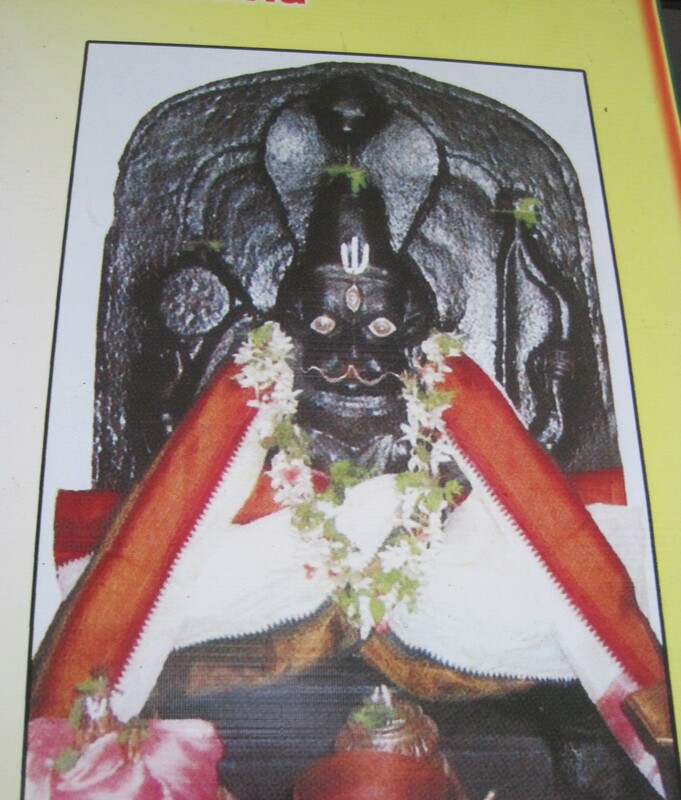 3) YOGANANDA NARASIMHA SWAMI: Situated at a distance of 3 kilometres from Lower Ahobilam, this can be approached by foot. It was here that Prahalada mastered the art of yoga from Perumal Himself. The divya mangala swaroopam of the Lord is eye captivating. Perumal is seen alone in Yogaasanam. 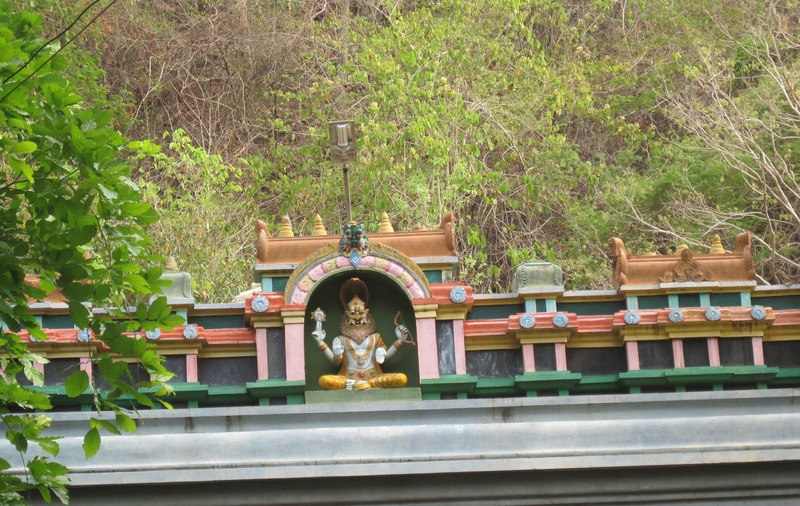 4) CHATRAVATA NARASIMHA SWAMI:- This temple is situated at a distance of nearly 3 kms from Ahobilam on a different route also reachable on foot . 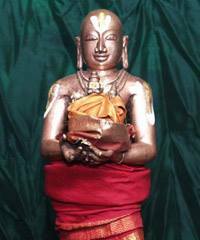 As Perumal is seated alone under a peepul tree which protects Perumal like an umbrella, He is known as Chatravata Narasimhar. This Perumal is fond of music played by Gandharvas. It looks as if the Lord is deeply engrossed in music by clasping His hands. We were told that He is fond of Adi Thalam. Reptiles keep moving in this place but they don’t harm the devotees. One has to take care of these. 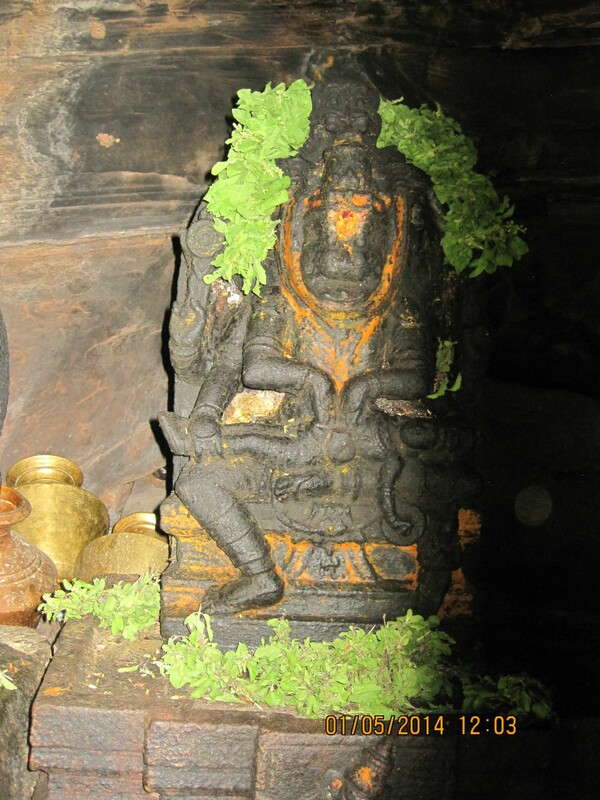 5) UGRA NARASIMHAR SANNIDHI:- This temple is in Upper Ahobilam. 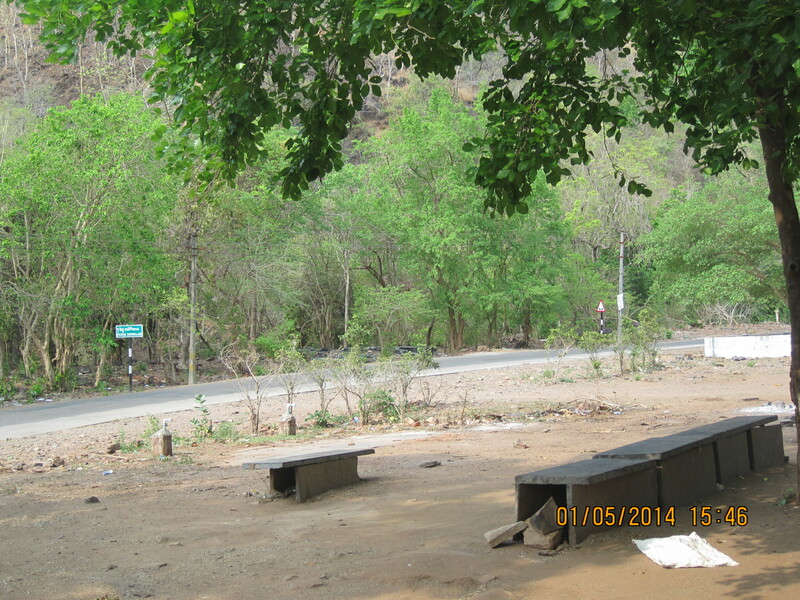 There is a narrow bus route and it takes about 40 minutes to reach this place from Lower Ahobilam. This is considered as the divya desa temple. 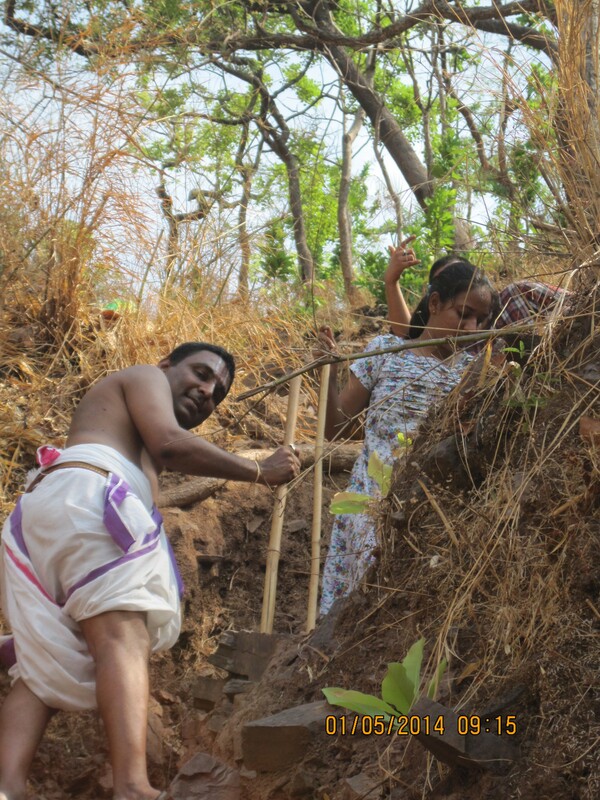 Usually, pilgrims have bath in Bhavanaasini or Paavanaasini (a spring which flows from the top of the hill) and then have Perumal’s darsanam. A dip in Paavanaasini absolves all the sins committed. Though there are no proper bathing ghats, still we can see hundreds of devotees having holy dip unmindful of their surroundings. This temple is situated between Upper Ahobilam and Lower Ahobilam.. As the divya mangala moorthi is installed under Karanja vruksham, the deity has been named so. Perumal is seen in VeetruirundhaKolam and is holding Sarngam (bow), dhanus (arrow) and chakram . As usual,Adisesha acts as “Kudai”(refer Irundhal Kudaiyam…) and isprotecting. The theertham here is known as Bhairava kundam. Hanumar who visited this place was astaunch Rama bhakta . Lord Narasimhar appeared to Hanumar, who was a staunchRamabhakta, with bow and arrow thus showing that He is Rama Himself. This Lord is in Padmasaanam pose. One can have darshan of Hanumar also. We are reminded of Sholangur . This holy shrine is situated two kilometres away from Upper Ahobilam. Perumal came in search of Mahalakshmi Thayar who was doing penance here and placed Her on His lap. Hence, Perumal seen along with Thayarhas a somya (graceful) form. Due to Thayar’s presence, Perumal graces even the worst sinner . Azhwar refers to this Perumal in pasuram no. 1016 (Peria Thirumozhi) when he says that bhaktas are always protected by Perumal andonly the wicked have to fear . This Lord gives abhayam to His devotees and Thayar bestows Asthaaiswaryam and grants the wishes of the devotees. There is a vigraham of Thirumangai Azhwar in the sanctum . Outside the temple, there is a small pillar with murthis. Those who are not able to go to Ugra sthambamcan prostrate this pillar. 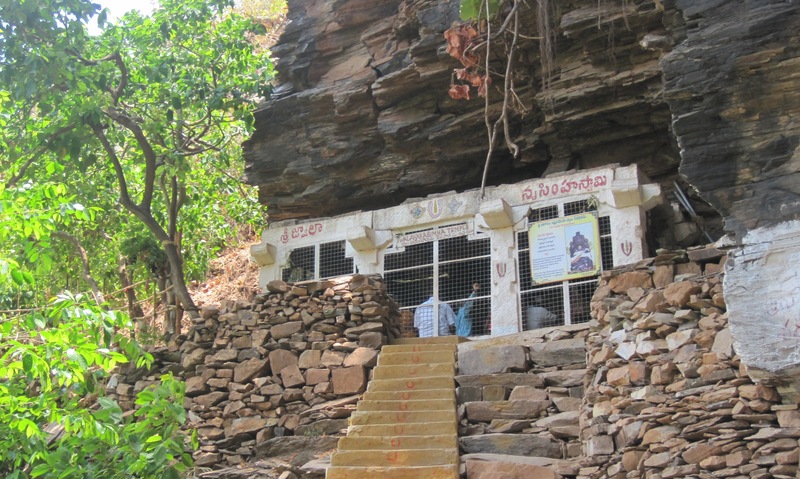 This temple is located at a higher altitude called AchalAchaya Meru that is four kilometers from Ugra Narasimha Swamy and may bear around 2800 feet. 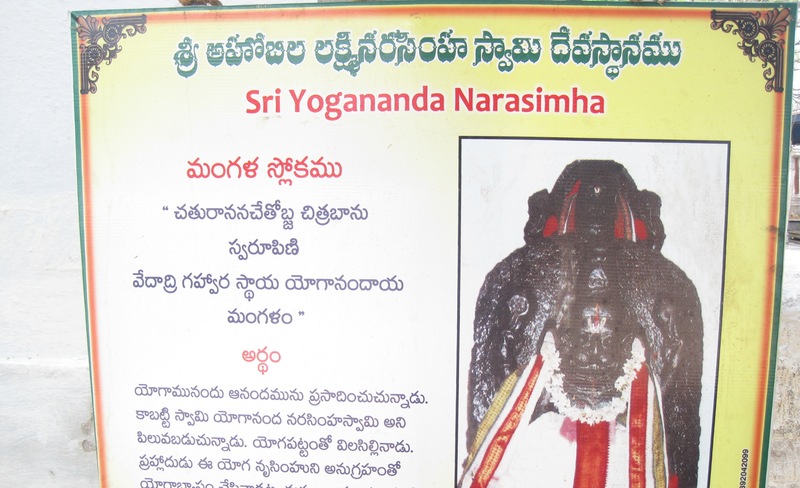 And can be approached from Malola Narasimhar shrine. It takes about 2 hours to reach this temple from Upper Ahobilam. The path is slippery and as mentioned care has to be taken. It was here that Lord killed Hiranyakasipu by tearing his stomach with his spear like nails. The deity with 10 hands which is approximately 3 feet high and is scaring to look at. 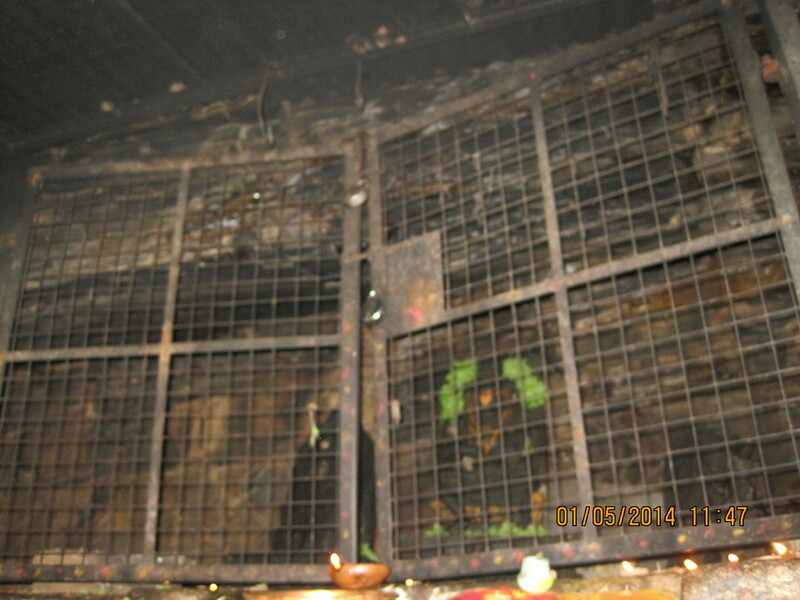 This is the spot, where Lord NarasimhA’s anger grew to the highest level during and after the tearing apart of HiraNyan . 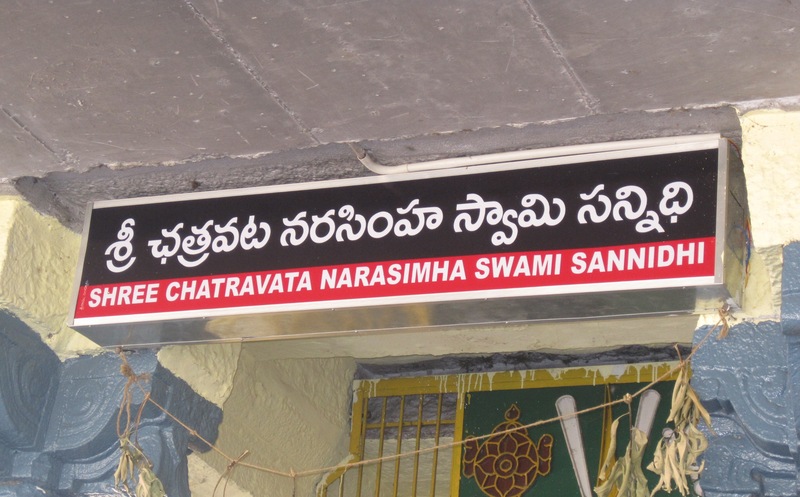 There are three mUrthams at this sannidhi . At the center is the JwAlA Narasimhan with Garudan at His feet . He is holding HiraNyan’s head and ankles with one set of hands ; with the third and fourth hands , He is tearing apart the stomach of HiraNyan ; with the fifth and the sixth hands , He is holding Chakram and Sankham ; with the seventh and the eighth hands , he is pulling the two strands of HiraNyan”s intestines up and wearing them as a garland around His neck .The Uthsava mUrthy of JwAlA Narasimhan is at the Lower AhObilam temple with 10 hands. Beside this shrine, there is a small pond known as “Raktha Kundam” where the Lord is believed to have washed His blood-stained hands . The water is reddish in colour and this was the explanation given by the guide to us. Recently, a temple has been constructed for this Lord and a archakar is appointed to perform Nitya Thiruvaaradhanai. 8) PAVANA NARASIMHAR: This temple is situated six kilometres away from Upper Ahobilam towards north east on the banks of River Pavana. It is difficult to approach this temple as wild animals keep roaming earlier If one wishes to visit this temple, he must do so during daytime with the help of a guide. The path is too narrow, the trek amidst cluster of rocks is strenuous . 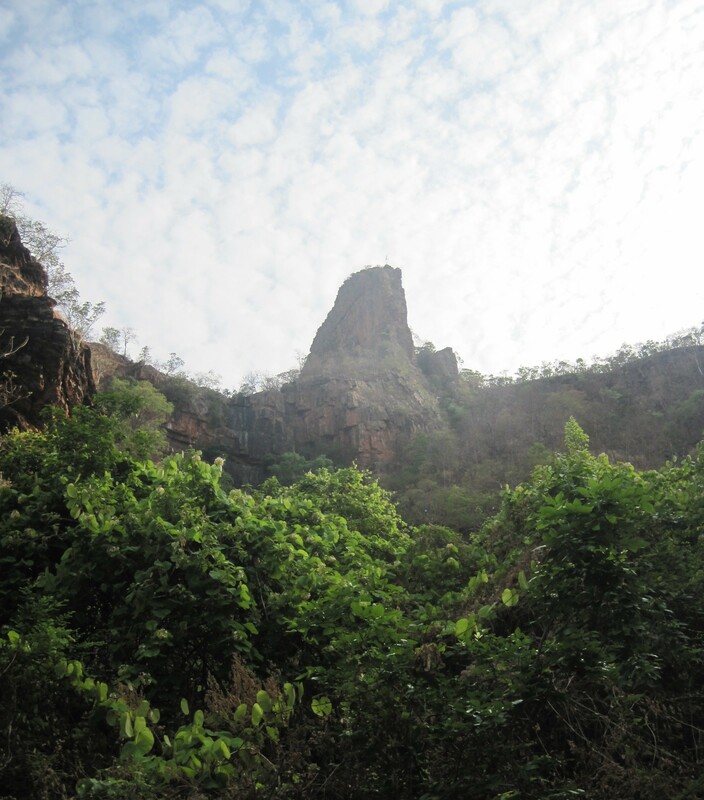 It takes about 45 minutes for trekking.One can view Malola Narasimhar shrine and few water falls on the way on the other side of the mountain. 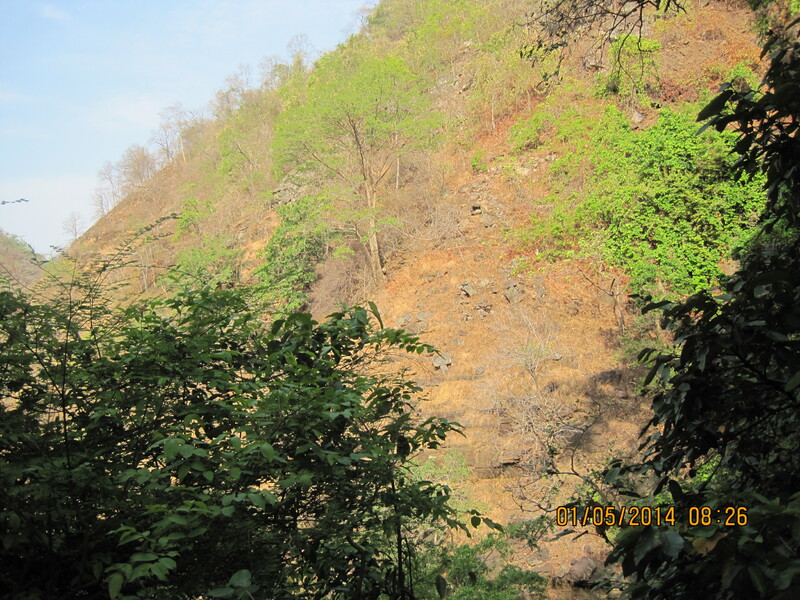 Forest fire is very common in this place and this helps in one way to ward off wild animals. 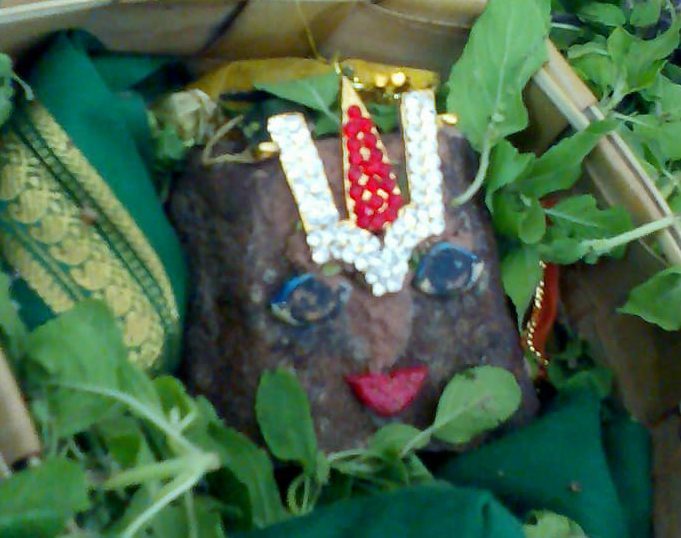 It is believed that devas offer worship to this Lord. The Lord is seen along with Thayar . The local tribals usually observe fast on Saturdays and offer flowers, honey, fruits, rice, jaggery etc. to the Lord.The general notion that “bali” (sacrifice) is done here was rebuked by the priest. He said that the sacrifice would be done elsewhere in the jungles . He also added that wild animals do not roam near the temple and only during severe summer,they come to the river bank to quench their thirst. They usually do not hurt anyone.Besides the above shrines, other places of interest are Prahalada Padi or PrahaladaMettu (Mettu in Telugu and Padi in Tamil means “step”) and Ukku sthambam. PRAHALADA PADI is the place where Prahalada had his vidyabhyaasam from Sukracharya’s sons. The way to Prahalada padi though tough is breathtakingly beautiful with river flowing on one side and with various water falls amidst a huge valley. This reminds me of the route to Badrinath. 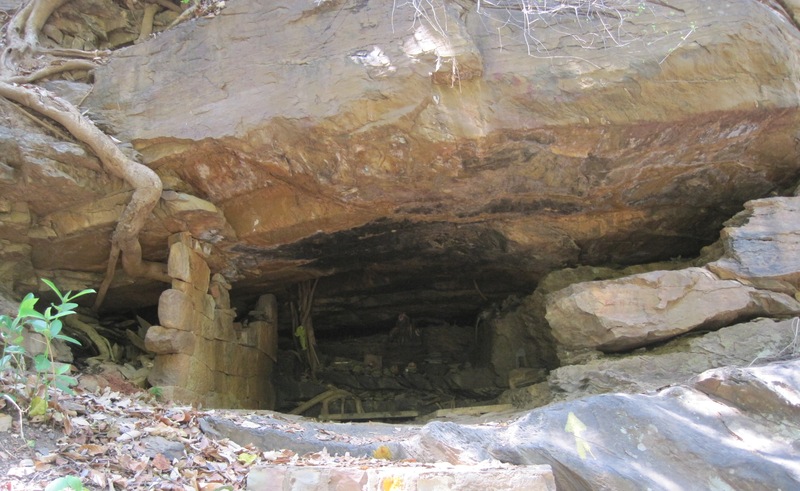 The temple is in a small cave and one has to crawl to enter inside the cave. Only 4 persons can be accomodated insideat a time. 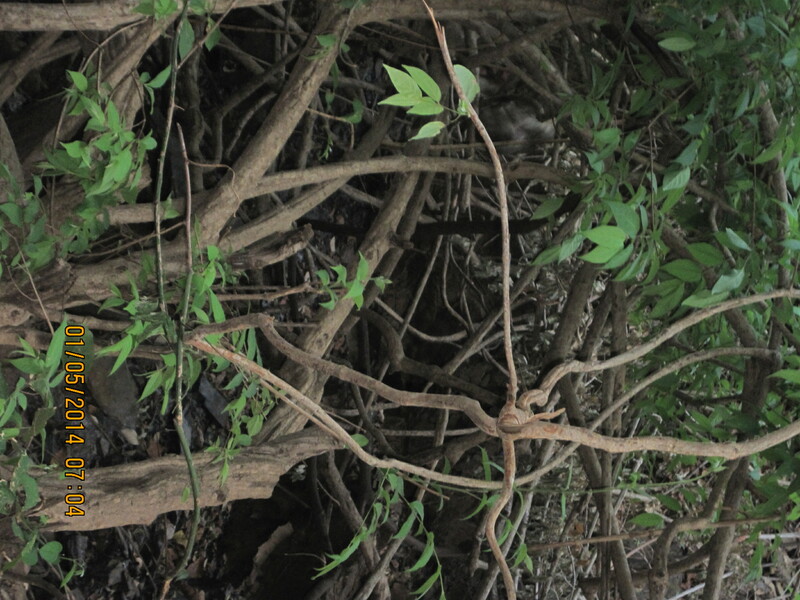 Mountain lizards and bats move freely here.It was here that the child started propogating Lord’s qualities. Prahalada used to resort to this place for meditating upon the Lord. There is a vigraham of Narasimhar in centre . to its right, there is an idol of Chakaratazhwar and to the left , there is a vigraham of Lord Vishnu. which is situated at a distance of 8 kms from Upper Ahobilam isthe pillar from which the Lord emerged . The pillar which is situated at the edge of the cliff is split into two as a proof that Lord appeared from this pillar. Ahobilam usually give their offerings here. It is very difficult to reach this place which is at a highest altitude .Doing pradakshinam around this pillar is even more difficult as it isin the cliff. Near the ukku sthambham (iron pillar) as the Telugus call, there is Perumal’s Thiruvadi. The climb is very difficult . Only with His grace can one visit this place. One has to have a sharp vision and a flexible body to bend, crawl etc.This can be approached from Prahalada padi on the way to Jwala Narasimhar shrine.While describing this pillar, Sri Mukkur Swamy says that the entire world is still pregnant with Narasimhar inside except this because Perumal has come out of it.The symbols of Vishnu, namely, Sankhu, Chakram, Naamam are carved on the face of the hill. One can have a bird’s eye view of the entire Ahobilam from this place. Theatmosphere is calm and serene . Various waterfalls all around looking like thin streams makes us wonder and appreciate the nature and Lord’s creation. It’s a best place to meditate. JwAlA Ahobila MaalOla Krodha Kaarancha Bhaargava..
YogAnanda Kshathravata Paavana Nava MUrthaya…..
Adiyen will feel honoured for being a small instrument in devotees wishing to have darsanam of LORD by guiding with route and other details . Narasimha Bhagavan ki Jai. Jai Bhakta Prahlad! Thank you for your vivid description of your pilgrimage to Ahobilam. Hope to be able to experience this holy Dham of Narasimha Bhagvan. Your blogs have been constant source of inspiration for me to undertake pligrimages to holy Dham. Your service to the Vaisnava community is invaluable. May the Lord bless you to continue to be a source of inspiration to all Vaisnavas. 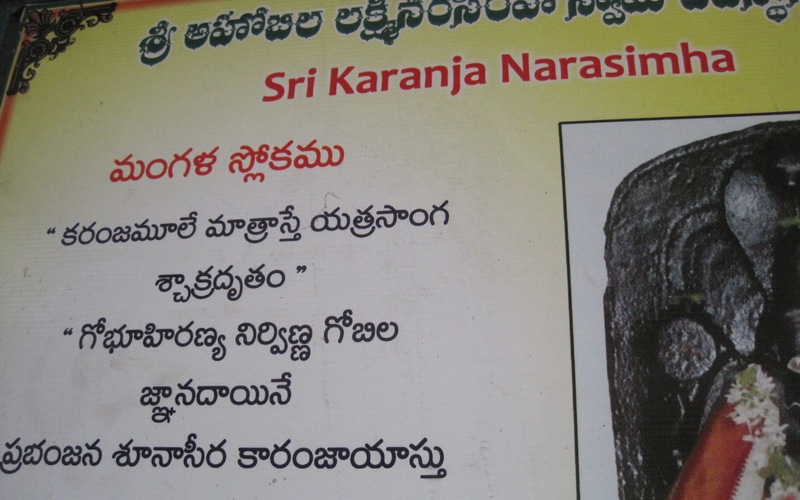 Adien saranam to lord narasima. i dont have words to describe my happinies on reading this .Narasimhaswamy bestowed you with such a noble article which makes any one reading this to visit Ahobhilam as early as possible.please also update any other vaishnava divyasthalas. May god bless you with much more articles and also show a path to amoksha. Adiyen Ramanuja dasan . Thank you for devareers kind words and best wishes . Aspiring to serve LORD and HIS devotees .Adiyen . though I’m from the other sect of brahminhood(smaartha),I was keen on visiting perumal abodes,out of the 106 divya desams possible by a human soul, with my wife&14 yrs old son, I’v vompleted 99, excl.ahobilam and the western,northern&nepal D/Desams.I’v been trying to have a dharshan of ahobilam,some how,I could not undertake this holy pilgrimage.If god willing with nidhi&blessings, I’ll visit the remaining 7 D/desams.your description about Ahobilam was breath taking and so lively, as If I’m being guided personally around the holy ahobila abode of nrusimha.thanks ji. OM NAMO LAKSHMI NAARASIMHAYA NAMAHA……!! U r narration is great sir,thanku verymuch …. Adiyen Ramanuja dasan ! Thanks for the kind words ..Its all HIS mercy ..May LORD bless you with HIS darshan soon ..